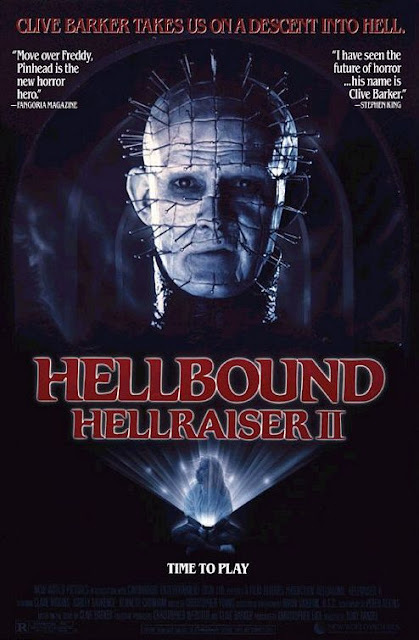 I've always loved the first hour of Hellbound: Hellraiser II (1987) more than the rest of the film. The buildup in this case is much more interesting than the payoff. Once the characters actually go to Hell, Hellbound starts to gradually lose steam. I do appreciate the special f/x artistry that went into Hellraiser II and it's nice to get more Cenobite action but the delivery and the performances veer a bit too much into horror tropes and cliches at times in the last 40 minutes. Kenneth Cranham as Doctor Channard is a much more menacing presence before he becomes a Cenobite, where he proceeds to do nothing but spout one-liners. Not to mention that some of the sets/design are a bit cheesy and the editing a bit sloppy in the Hell segments. Still, it's good grotesque gothic entertainment.